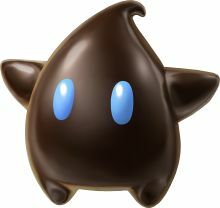 Polari is an elderly, blackish brown Luma who appears during the events of Super Mario Galaxy. Said to be one of the oldest Lumas in existence, Polari serves as Rosalina's most trusted advisor. Having extensive knowledge of the Comet Observatory, Polari serves as a guide of sorts to Mario, showing him a map of all of the galaxies visible from that location. While Polari's name is never mentioned in-game, and is instead only mentioned in the instruction manual, his name may be derived from Polaris, also known as the North Star. Polaris was often used by sailors as a guide in navigation, not unlike how Polari guides and advises Rosalina and Mario. His name may also be derived from polarity, which is the brightness of a star. Conversely, his appearance may be a reference to black dwarfs, which are dead stars. Polari's first appearance is in Super Mario Galaxy when Mario retrieves the first Grand Star and lands on the Comet Observatory. Polari looks at the beacon with Rosalina and exclaims that "now the poor Lumas may survive". When the player first enters the Terrace they will meet Polari and a Blue Luma that soon transforms into a Pull Star to allow Mario to travel to galaxies. When Mario returns with one Power Star on his belt, Polari will teach him about Star Bits and how Lumas love eating them. Other than that, Polari's main importance within the game is to provide a map of all the galaxies that Mario can visit and their Power Stars and to inform Mario about when the enemy base has been located. It is unknown what happens to Polari at the end of the game; he is not seen flying into the giant black hole, and in the secret ending, he does not appear alongside Rosalina or in the Comet Observatory at all. Polari also appears in the Super Mario Kun manga's Super Mario Galaxy arc (volumes 38-40). He is a blackish brown Luma whose age is apparent from his wrinkles. In volume 40, he grows into the final Grand Star, in contrast to his navigator role in the games. Polari makes a cameo appearance in Mario Golf: World Tour in Rosalina's best post-hole animations. In Super Smash Bros. for Nintendo 3DS, Super Smash Bros. for Wii U and Super Smash Bros. Ultimate, when Rosalina respawns a Luma, it has a chance of appearing with Polari's coloration. The tips in the latter two games state this is in fact Polari, although his voice is no different from the other Luma colors. Polari reappears in Mario Sports Superstars, filling the same role he has in Mario Golf: World Tour. Polari, unlike all other known Lumas, is a blackish brown color and has sky blue eyes. He is relatively the same size as all other Lumas, excluding the larger Lumas like Hungry Lumas, Lumalee and Comet Tico. Polari shows certain similarities to Toadsworth. Both are older members of their respective species, both are highly protective of the person they advise, and both have a coloration that is unusual when compared to others of their species. He is additionally shown to have wisdom that proves useful to Mario on his adventure, such as telling Mario about the Trial Galaxies. As all Lumas, Polari loves Star Bits and may thank the player if they shoot a Star Bit at him. Polari also makes a distinctly different noise when compared to other Lumas, which is reflected by his voice having a deeper sound and his lack of making the usual Luma "joy" sound. Instruction manual: This elderly Luma is Rosalina's most trusted advisor. He knows all about the observatory, and if you speak to him, he will show you a map. 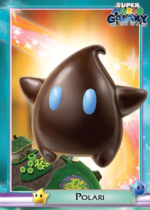 Trading card: An elderly black Luma that is one of Rosalina's most trusted advisors. Polari serves as Mario's guide to the cosmos from the domes on the Comet Observatory. Polari will show Mario a map of the galaxy showing where he's collected so far. This page was last edited on April 5, 2019, at 22:53.